60 Second Vote: Does the government cull of "Independent Expert Panels" need to be halted? Does the Government have a policy of killing off bodies that hold government accountable? What do you think? Does the government have a policy of closing down bodies that monitor it? independent monitoring panels are endangered species, when it is government that is being monitored. 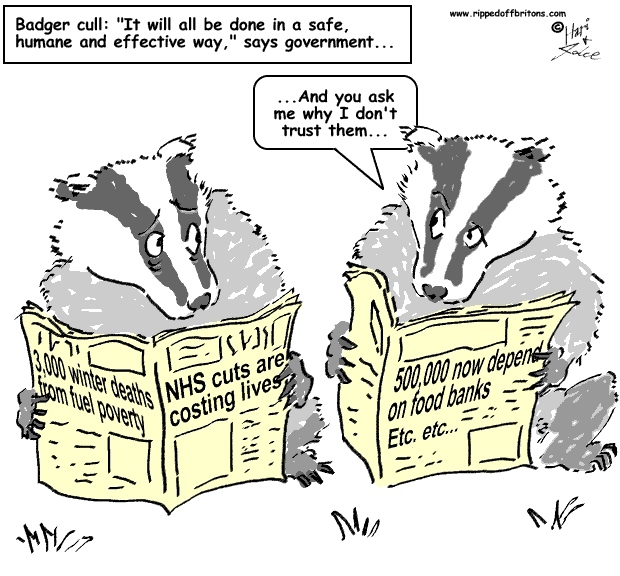 October 2012: The "Badger Culling Pilots" panel was created by DEFRA "to help Ministers evaluate the effectiveness, humaneness and safety of controlled shooting". February 2014: The panel reports that the badger culls were 'cruel' and 'ineffective'. 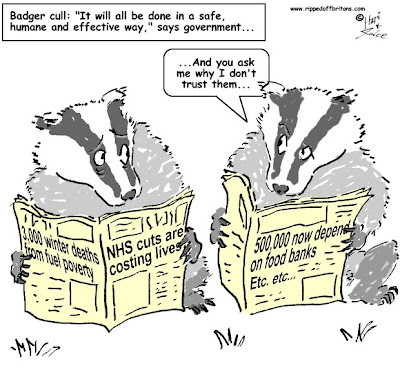 April 2014: Government announces the committee will not report on the next cull. The key measure was that local authorities were allowed to choose and pay their own auditors. "Today’s draft Bill will recast local audit - making councils more accountable to local citizens, stripping out unnecessary bureaucratic costs, and letting councils appoint their own auditors from an open, competitive market. By replacing the centralised Audit Commission with a more streamlined and transparent system we will save the public purse £650 million over the next five years. But we are determined to ensure that councils continue to deliver the high quality service their residents deserve, which is why our new framework will uphold the tough standards of auditing we expect." One need look no further than the banking crash of 2008 to see what happens when naughty boys and girls get to choose their own form monitors. According to the National Fraud Agency there was £2.1 billion lost to fraud in Local Government in 2012-13. Speaking of which, in March 2014 the National Fraud Agency (NFA) was culled. The NFA produced statistics on fraud in the UK, including that Benefits & Tax Credit fraud is one seventh the size of Tax fraud. Casting a squalid light on Government policy of hunting down poor people while sacking tens of thousands of HMRC taxmen who might harry the rich. And in January 2014 all but one of the members of the Independent Parliamentary Standards Authority were culled, due to excessive badgering of MPs over their expenses. They keep getting away with it. Scotland was almost rid of them. Sadly England has no party worth voting for. Every new term they get bolder, greedier and more power crazed. Enough !! I voted perversely as corrupt British governance cannot be influenced.